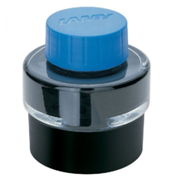 Fountain pen ink is a water-based ink intended for use with fountain pens. Because fountain pens operate on the principle of capillary action, ink for them is almost exclusively dye-based. Pigment inks (which contain solid pigment particles in a liquid suspension) tend to clog the narrow passages of the pens. Some pigmented inks do exist for fountain pens, but these are uncommon. The ideal fountain pen ink is free-flowing, free of sediment, and non-corrosive. These qualities may be compromised in the interests of permanence, manufacturability, and in order to use some widely available dyes. Most fountain pen manufacturers also provide a brand of ink; for example Parker sells 'Quink', '. The recent resurgence of fountain pen use has also created a market for companies that specialize in ink, such as the British company Diamine and the American company, Noodler's Ink. These manufacture ink in dozens of different colors. Trivia Question: What is the most popular selling bottled ink?